We believe God has a wonderful plan for every child and desires for them to discover their unique potential in Him. 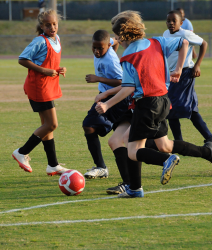 Our strategic initiatives include summer camp, sports programs and leadership development for children. We are honored God’s favor has been on us as we serve in the name of Jesus Christ. 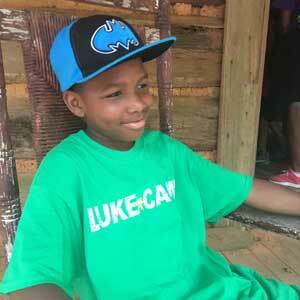 LukeCamp is a summer day camp for urban youth ages 7-14. LukeCamp includes tutoring, Bible study, job exploration, community service, fun and weekly reward field trips. LukeCamp concludes with a weeklong session of overnight camp, which has traditionally been held at Big Canoe in the North Georgia mountains. Activities conducted during this week include mountain biking, kayaking, hiking, swimming, spelunking and much more. Our Mission is to lead sports leagues that serve as incentive-based tools to enhance scholar’s academic performance through teamwork, building character and developing athletic skills. We operate Co-ed Flag Football, Co-ed Flag Football Cheerleading, Boys Basketball, Girls Basketball, Basketball Cheerleading and Dance Teams, Boys Soccer, Girls Soccer, and brand new for 2018 Ultimate Frisbee and Kick Ball programs. The Annual Golf Charity Benefit is in it's 18th year of sending urban kids to LukeCamp and LukeSports programs. In 2017, we moved the event location to the beautiful Stone Mountain Golf Club and utilized both 18 hole Lakemont and Stonemont golf course. We have opportunities for corporate and individual sponsorship's, as well as the ability to donate even if you are not playing golf. In 2018 we hope to have 240+ golfers participating in what is quickly becoming a can't miss event each year. LukePrep is a 12-week leadership program for seventh grade students with weekly instruction and seminars taught by corporate leaders and LukePrep staff under the care of school administrators. Through group work, class instruction, homework, team presentations, etc. students learn business fundamentals and leadership skills. Core curriculum includes resume writing, HR best practices, presentation skills, marketing, management, personality evaluations, business strategy, emotional intelligence and entrepreneurial endeavors.